Since 2014, the Healthcare Center of Excellence (HCOE) has been tracking the healthcare industry’s progress towards population health analytics using their proprietary Healthcare Transformation Change Model. This model was developed in 2013 to help healthcare organizations understand the requirements to become a data-enabled healthcare organization. The concepts were based on a Gartner recognized model Professor Bennett previously co-developed. 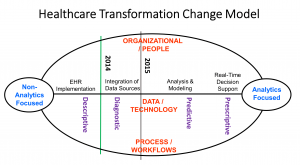 Based on the model, the HCOE determined that in 2014, the industry was just past the “EHR Implementation” stage. In 2015, the dial moved a bit further as many organizations began achieving success with integrating data sources and building their data warehouses. Complete the form below to download the State of Population Health Analytics 2016 Report.